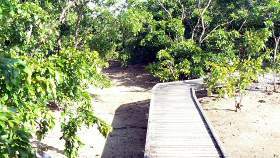 This Mangrove Boardwalk is a raised aluminium walkway which is accessed from the rear of the Lake Alexander car park after a walk along a marked pathway through open bush. Look for the beginning of the track to the mangroves at the fence along the back of the car park, it is marked with a sign but not very obvious. The walk from Lake Alexander takes about 20 minutes, the last section along a raised metal walkway above the muddy mangrove floor. With tides of up to 8 metres, this walk can be very different at different times. A short walk along a gravel path which follows the high water beach brings you to the beginning of the metal mangrove boardwalk. 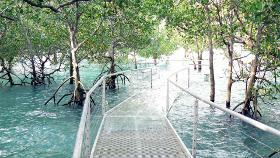 This metal bordwalk heads straight out towards the sea through the dense canopy of mangrove trees. When the tides is high it is only inches above the water for most of it's length. This a crocodile territory, so stick to the safety of the walkway. High Tide covers the last section of the walkway. The walkway slopes gently down out from the shore, so a rising tide will cover the end section first, allowing visitors to return without getting cut off by water. Information boards along the walk describe the flora and fauna of the area. 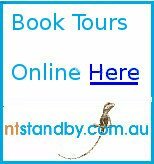 The Larrakiah people used the recourses of the mangroves in their traditional lifestyle and were known as 'the water people'. 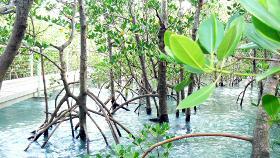 More mangrove photos and information. Casuarina Coastal Reserve, Charles Darwin National Park and another elevated walkway at Channel Island all provide access to different parts of Darwins Mangroves. Return from Darwin Mangrove Boardwalk to Enjoy Darwin Home.